Dutch Fork Animal Hospital carefully screens all patients to make sure it is safe to operate on them. We tailor each service to the individual patient, and offer the most advanced surgical techniques. Our facilities feature state of the art technology including: heated surgery tables, advanced sterilization techniques, full blood testing, intensive after-surgery care, and ECGs. All veterinary and technical staff are fully trained, which ensures your pet receives the best care. Additionally, a board certified surgeon is available for consultations and performs surgeries right here at Dutch Fork to provide specialized procedures without the need to go to a different hospital. 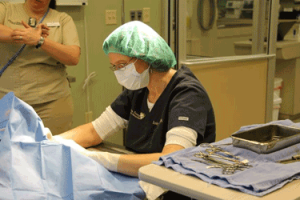 We always make your pet a top priority during procedures, and our technicians carefully monitor your pet’s wellbeing.